Angelman syndrome (AS) was first described in 1965 by Dr. Harry Angelman, a British pediatrician. He reported three children with a similar pattern of mental retardation (MR), seizures, ataxia, easily provoked laughter, absent speech, and dysmorphic facial features whom he called "puppet children." In 1995, Williams et al.,  established the clinical criteria for the diagnosis. The prevalence of AS is estimated to be around 1:10 000-1:20 000. AS is a clinical diagnosis that can be confirmed by either genetic studies in about 80%-85% of the cases. A 7-year-old female presented with complaints of delayed milestones and seizures. She is the 2 nd order in the family, born of nonconsanguinity with normal birth and delayed milestone. She attained neck holding at the age of 2 years, sitting with support at the age of 3 years, standing without support at the age of 4 years, walking without support at the age of 5 years. She has only palmer grasp now, feeds herself without spilling, and spells only bisyllables and is not toilet trained. There was no regression of attained milestones. When she started walking independently, she walked with wide-based ataxic gait. She was always smiley with a history of inappropriate laughter and happy demeanor. She did not have history of limb incoordination or any extrapyramidal symptoms. Her intelligence quotient was found to be 24 on Seguin Form Board test, suggestive of severe MR.
An 8-year-old girl, the elder sister of the above, also had similar history of delayed milestones (social, motor, language and cognition), wide-based ataxic gait, since she learned walking with support. Always she used to remain happy and cheerful with frequent excessive, inappropriate laughter. There was no history of seizure, vision impairment, hearing loss, motor incoordination, and any extrapyramidal symptoms. Her social quotient (SQ) was found to be 15 on Vineland Social Maturity Scale, suggestive of profound MR.
A 5-year-old girl, younger sister of the above two also had complaints of difficulty in speech, poor comprehension, and communication ability, compromised ability to do the activities of daily living with history of global delayed developmental milestones and ataxic gait. There was no evidence of vision impairment, hearing, motor function, or history of seizure. She had microcephaly with an open mouth and protruded tongue. Her SQ was found to be 19 on Vineland Social Maturity Scale, suggestive of profound MR.
All the three children were assessed on Kidde's schedule for Affective Disorders and Schizophrenia for School-Age Children-Present and Lifetime version, and they did not qualify for any syndromal psychiatric illnesses. The routine blood investigations including copper studies (serum copper, ceruloplasmin, and 24 hour urine copper) and serum alpha fetoprotein, serum homocysteine were within normal range. The magnetic resonance imaging (3Tesla MRI) of brain was normal in all three siblings. Electroencephalogram (EEG) of case 1 had revealed high-amplitude (200-300 μV), generalized 2-4 Hz spike-wave complexes with slow background rhythm of delta range [Figure 1] and [Figure 2]. 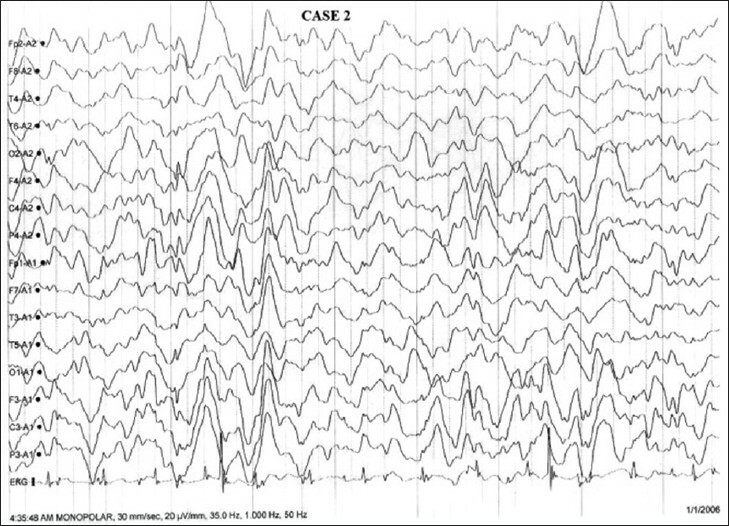 EEG of case 2 showed slow background with intermittent high amplitude generalized sharp and slow wave without history of seizures [Figure 3]. 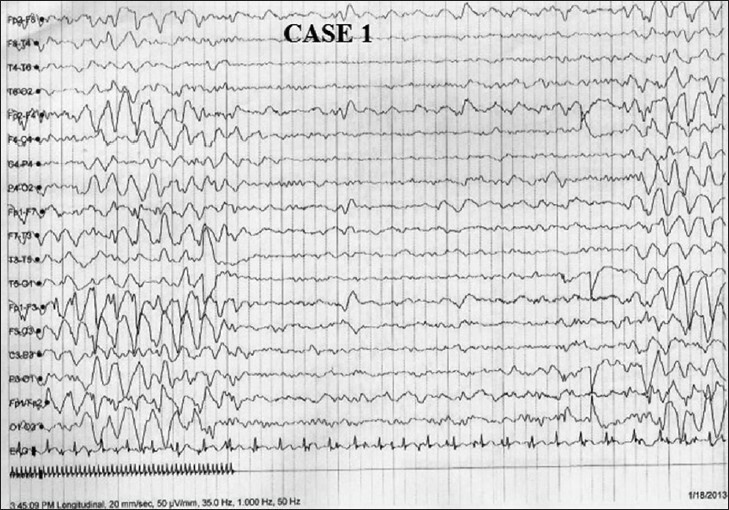 The EEG of case 3 was normal. Karyotyping of all the three children revealed 46×× pattern. Genetic analysis of case 2, using amplification of deoxyribonucleic acid sequences of SNRPN gene did not reveal any abnormality suggestive of mutation, deletion, or uniparental diasomy (UPD). Genetic tests for other siblings could not be performed due to low economic profile of patients. Ubiquitin-protein ligase (UBE3A) gene could not be done due to unavailability and financial constraints. Figure 3: EEG showing slow background with intermittent high amplitude generalized sharp and slow wave without history of seizures. Angelman syndrome usually becomes apparent at 1-4 years of age with the average age at diagnosis being 6 years. ,, The most consistent clinical manifestations (100%) are developmental delay, speech impairment with better receptive, and nonverbal communication skills, gait ataxia, behavioral abnormalities including inappropriate laughter and apparent happy demeanor, hypermotoric behavior, and short attention span. Microcephaly, seizures, and abnormal characteristics EEG are frequent manifestations (80%) of AS. EEG abnormalities are more prominent in the first 2 years of life and become progressively less significant after 10 years of age. In childhood, the EEG showed high voltage 4-6 Hz activity and in adulthood it showed rhythmic triphasic 2-3 Hz activity of high amplitude (200-500 mV), mixed with spikes or sharp waves with a maximum over the frontal regions. It is characteristic in AS and can occur before a clinical diagnosis is considered in about 45% of these children. , Other associated features are (20%-80%) flat occiput or occipital groove, protruding tongue, swallowing disorders, feeding difficulty during infancy, prognathia, wide mouth, widely spaced teeth, frequent drooling, strabismus, hypopigmented skin, light hair and eye color, hyperactive lower limb deep tendon reflexes, increased sensitivity to heat, sleep disturbance, and attraction to water. Paroxysms of easily provoked, prolonged laughter may start as early as the age of 10 weeks and become more evident in the first 6-12 months of life. Age at onset varies from 1 month to 5 years (mean: 2-3 years). Mowat-Wilson syndrome: It is caused by mutation or deletion of ZEB2 gene. The clinical presentations are seizures, happy demeanor, prominent mandible and ear lobes, decreased speech output, microcephaly, constipation, Hirschsprung's disease, congenital heart defects, or agenesis of the corpus callosum. Christianson syndrome may mimic AS. It is an X-linked disorder and usually presents with apparently happy affect, decreased intellectual performances, ataxia, microcephaly, and seizure. The EEG pattern differs between AS and Christianson syndrome. AS typically shows a generalized high amplitude, slow spike, and wave complexes of frequency 2-4 Hz, while those with Christianson syndrome have a more rapid (10-14 Hz) background frequency. It is caused by mutations in SLC9A6 gene. Adenylosuccinate lyase deficiency may mimic AS. It results in accumulation of succinylpurines. The common clinical features are psychomotor regression, hypotonia, seizures, severe speech deficits, excessive laughter, a very happy affect, attention deficit, hyperactive behavior, autistic features, and stereotyped movements. Methylenetetrahydrofolatereductase deficiency: It is associated with low methionine and an elevated homocysteine blood level was reported in a boy with happy demeanor, ataxic gait, absent speech, and flattened occiput. Rett syndrome: It is caused by mutation of MECP2. Usually seen in female infants and associated with seizures, microcephaly, and speech impairment without having distinctive happy affect. Unlike Rett syndrome, AS do not have regression of milestones. Others: Sometimes cerebral palsy, Lennox-Gastaut syndrome, pervasive developmental disorder, static encephalopathy, and chromosomal disorder like deletion of 15q12 ( Prader-Willi syndrome More Details) may mimic AS. In our cases, there was absence of classical genetic imprinting, mutation, deletion, or uniparental diasomy as revealed from genetic analysis; however, we could not analyze for the gene UBE3A due to unavailability and financial constraints. The diagnosis was made on the basis of consensus clinical criteria by Willam et al., characteristic EEG findings and exclusion of other AS mimic. This is a unique case series, as AS is manifested in all the three biological siblings (sisters) in the same family. The morbidity due to profound to severe MR with significant disability due to impairment of locomotion had affected the family economy and increased the caregiver burden. In underdeveloped and developing countries, where poverty, unemployment are the major threats to the existence of common man, Severe to profound intellectual disability in all biological siblings carries a lot of significance. Rehabilitative measures, adequate control of behavioral problems, appropriate treatment of seizure, and speech therapy can increase the quality of life of the individuals with AS and decrease caregiver burden and stress. 1. Angelman H. ′Puppet′ children. A report on three cases. Dev Med Child Neurol 1965;7:681-8. 2. Williams CA, Driscoll DJ, Dagli AI. Clinical and genetic aspects of Angelman syndrome. Genet Med 2010;12:385-95. 3. Clayton-Smith J. Clinical research on Angelman syndrome in the United Kingdom: Observations on 82 affected individuals. Am J Med Genet 1993;46:12-5. 4. Petersen MB, Brondom-Nielsen K, Hansen LK, Wulff K. Clinical, cytogenetic, and molecular diagnosis of Angelman syndrome: estimated prevalence rate in a Danish country. Am J Med Genet 1995;60:261-2. 5. Boyd SG, Harden A, Patton MA. The EEG in early diagnosis of the Angelman (happy puppet) syndrome. Eur J Pediatr 1988;147:508-13. 6. Magenis RE, Brown MG, Lacy DA, Budden S, LaFranchi S. Is Angelman syndrome an alternative result of Del (15) (q11-13)? Am J Med Genet 1987;28:829-38. 7. Laan LA, Renier WO, Arts WF, Buntinx IM, vd Burgt IJ, Stroink H, et al. Evolution of epilepsy and EEG findings in Angelman Syndrome. Epilepsia 1997;38:195-9. 8. Laan LA, v Haeringen A, Brouwer OF. Angelman syndrome: A review of clinical and genetic aspects. Clin Neurol Neurosurg 1999;101:161-70. 9. Nicholls RD. New insights reveal complex mechanisms involved in genomic imprinting. Am J Hum Genet 1994;54:733-40. 10. Clayton-Smith J, Laan L. Angelman syndrome: A re-view of the clinical and genetic aspects. J Med Genet 2003;40:87-95. 11. Horsthemke B, Maat-Kievit A, Sleegers E, van den Ouweland A, Buiting K, Lich C, et al. Familial translocations involving 15q11-q13 can give rise to interstitial deletions causing Prader-Willi or Angelman syndrome. J Med Genet 1996;33:848-51. 12. Williams CA, Lossie A, Driscoll D, R.C. Phillips Unit. Angelman syndrome: Mimicking conditions and phenotypes. Am J Med Genet 2001;101:59-64.